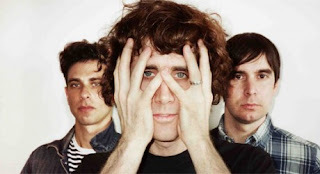 Thankfully sounding nothing like the Bee Gees track of the same name, The Rapture have returned with a dance club thumper which is closer in spirit to their debut 'Echoes' than the disco-funk of 'Pieces Of The People We Love'. Built around a piano riff, 'How Deep Is Your Love?' recalls commercial house music in the early 90s. Listen below, and download at DFA Records. The track reminded me of One More Chance' by Bloc Party, one of their better post-'Silent Alarm' releases. The song grows in intensity with its insistent beat as lead singer Luke Jenner's questioning cries of 'How Deep Is Your Love?' grow more desperate. Just as the song is verging on the repetitive, The Rapture throw in handclaps and saxophones at round the three minute mark. Somehow, it all works and is a promising sign for their upcoming album 'In The Grace Of Your Love'. Download the track for the price of an email address at DFA Records or Like on Facebook. 'In The Grace Of Your Love' is available pre-order.